This month, By people / In cities travels to Norway and looks in particular at its capital, Oslo. Tara Ishizuka Hassel takes a snapshot of Oslo's visual arts scene, focusing on the public infrastructure as well as the private initiatives that are making this city a vibrant and thriving center for contemporary visual arts. With the benefits of solid public funding, a strong and present art academy as well as high-profile local institutions working for the facilitation of national and international networking, Oslo has frequently been labelled as the `most vital and interesting art scene in Scandinavia(1). In 2004 the centre-left coalition government launched the so-called `Culture Lift´ plan, promising that one per cent of the state budget should be spent on culture by year 2014. This scheme included a list of 15 priority areas, such as the improvement of the living conditions for artists, increased support towards Norwegian film, performing arts and literature, as well as extended cultural education for children. The scheme was renewed in 2013 with a further emphasis on architecture, visual arts and crafts. Things are also happening on the side of public institutions. 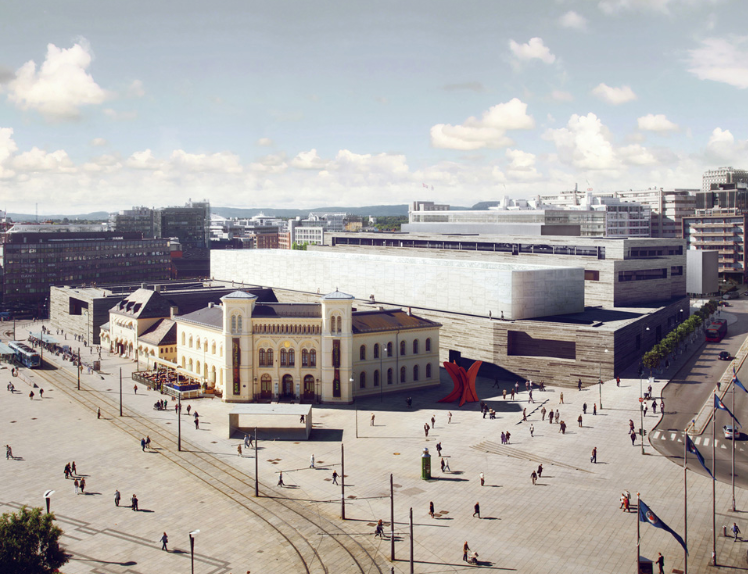 After a four-year long discussion about the future of the Edvard Munch Museum, the politicians recently agreed on moving the museum from Tøyen, a residential area on the East side of Oslo, to Bjørvika, a former container port that has been undergoing heavy urban development since the turn of the century. Bjørvika is also the site for the famous award-winning Opera House designed by the Norwegian architectural firm Snøhetta. The decision about the so-called Lambda building was taken four years after the Spanish architectural firm Herreros Arquitectos won the competition to design the new museum. However, the future of Munch´s heritage has since been subject to a heated political debate on whether to construct the Lambda building, to renovate the original museum building in Tøyen, or to move the Munch Museum to the current premises of the National Gallery. The agreement was reached just days before the 2 June 2013 opening of the exhibition `Munch 150´, marking the 150th anniversary of the birth of Norway´s most famous painter. 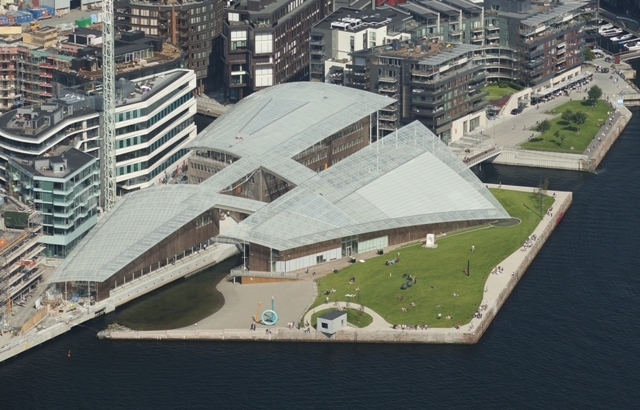 The Norwegian National Museum of Art, Architecture and Design is also relocating to Vestbanen, situated by the harbour between the shopping- dining and entertainment area Aker Brygge and the Oslo City Hall. In addition to the former National Gallery, the new building complex will house the Museum of Decorative Arts and Design, the Norwegian Museum of Architecture and the Museum of Contemporary Art. These four museums have so far been dispersed around the town. The new building is designed by German architects Kleihues + Schuwerk and is expected to open in 2019. Just like the new Opera House and the new Munch Museum scheduled to open in 2018, the construction is fully financed by public money. A short walk along the harbour promenade past Aker Brygge towards the South, brings you to Tjuvholmen, a former dock and shipyard area bought by private developers in 2005. After a period of heavy urban renewal Tjuvholmen has re-emerged as a posh and trendy neighbourhood housing upscale apartment complexes, restaurants and a number of successful commercial galleries including Galleri Riis, Peder Lund, Gerhardsen Gerner, Galleri Brandstrup and Pushwagner Gallery to mention a few. However, a large number of their visitors are merely dropping by on their way to the Astrup Fearnley Museum of Modern Art, a privately funded museum designed by Italian architect Renzo Piano. The complex, which opened to the public in 2012, is composed of three different buildings, whereas two of them constitute the museum and the third part is reserved office spaces. The buildings are placed on each side of a small canal, and the architect solved this by unifying them with a single curved glass roof reminding of a ship sail, referring to Tjuvholmen´s maritime past. However, while most people are amazed by Piano´s imposing architectural project, the museum has been criticised to have `too few women and far too many New York young guns with Gagosian pedigrees´ in their permanent collection2. Oslo-based artists are privileged with the exposure to art keeping high international standards. Many of them are graduates from KHiO, an autonomous art academy formed in 1909 that later merged with the formerly independent Design, Craft, Stage Arts and Opera academies to form the Oslo National Academy of the Arts. Ranked among the world´s 60 best design schools by Bloomberg Businessweek3, the academy aims `to educate artists and designers with the ability to both reflect on, and experiment in their chosen field, and make lasting contributions to the diversity of our society´, according to principal Cecilie Broch Knudsen. To reach their goal the academy, among other, engages a large number of leading practitioners in their own disciplines on short-term contracts and organises Open Forum, a weekly series of lectures, presentations, performances and conversations with artists, curators, theorists, and authors, in addition to the Academy Lectures featuring key speakers and positions in contemporary art and culture. A ten-minute walk down the river Akerselva is the Office for Contemporary Art Norway (OCA), a central hub for the local artist community. Founded in 2001 by The Norwegian Ministry of Culture and The Norwegian Ministry of Foreign Affairs, OCA provides Norwegian and Norway-based artists with support upon their participation in international exhibitions and projects. In addition to the very popular International Residency Programme, Studio Programme, Visitor Programme and the Semesterplan events offering a series of discursive and exhibition programmes focusing on current artistic and intellectual currents in Norway and abroad, OCA is acclaimed for their contribution to the internationalisation of the Norwegian art field. Where do the emerging artists exhibit their works? The many independent galleries are an important contribution to the vigour that characterises Oslo´s visual art field. A large part of them are run by artists and concentrated within walking distance in Grønland in the old town of Oslo, currently a melting pot of cultures and nationalities. To mention just a few - VI, VII; 1857; 0047; MELK; NoPlace; Holodeck; Tidens Krav and Galleri Maria Veie are worth a visit. The excellent Exhibition Guide for Oslo provides updated information on exhibitions and events on all levels in the visual arts field. Before closing I would like to mention the One Night Only Gallery (ONO) and the annual Autumn Exhibition. Both are based on an open call system, however the former only allows for the artist to present his or hers work for the duration of one night. Every Monday for four years, a new exhibition opened in the premises of the Young Artists Society in Oslo. According to organisers Mohammed Fadlabi, Tito Frey, Andreas Oxenvad, Jon Benjamin Tallerås and Erlend Grytbakk Wold, ONO aims `to constitute a connection between emerging artists and the audience as well as exposing the work to curators, collectors and colleagues, urging original ideas and often providing young artists with their first solo show´. In 2013 ONO relocated to Kunstnernes Hus, where activity is continued. Kunstnernes Hus is also the main venue for the Autumn Exhibition. Arranged by the association for Norwegian Visual Artists the prestigious exhibition often functions as a door opener for artists at the beginning of their career. Oslo´s art life is thriving both on the institutional, commercial and non-profit level. With a sustainable governmental support together with the commitment of local partners as well as a dedicated and engaged audience, I hope for this growth to continue to benefit artists and audiences in the future. Tara Ishizuka Hassel is the head of press and information at the Office for Contemporary Art Norway (OCA), a position she has held for nearly three years. Previously she worked in the arts and culture field in Tokyo, Japan, organising concerts and masterclasses with internationally renowned contemporary music ensembles, and promoting international cultural exchange in organisation with the Tokyo Metropolitan Foundation for History and Culture at the Tokyo Wonder Site, before she joined Japan's largest festival of contemporary performing arts, the Festival/Tokyo (F/T), where she was the head of the International PR section, as well as a production coordinator for international performances. She holds a Master of Arts from the University of Oslo, Norway. 1Henrik Plenge Jacobsen: `The Oslo Case´, published in the online art magazine Kunstkritikk on 10 May 2013.